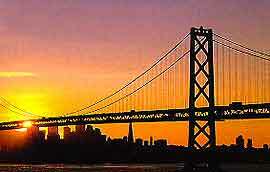 San Francisco contains many truly world-class sights, instantly recognizable at a glance. Perhaps the most famous of San Francisco's landmarks is the stunning Golden Gate Bridge, which features a number of lookout points offering superb views across San Francisco's bay area. Other highlights in and around the city of San Francisco include the Golden Gate Park, which was completed in the 1890s and has long been an important part of city life, containing botanical gardens and many areas of tranquility, offering the perfect place to escape from the San Francisco's bustling city center.